Take Exit 20 (Tilton/Laconia, Rte. 3). At the end of the off-ramp, turn LEFT, you are now on NH Rte. 3, heading North, towards the city of LACONIA. Stay on Rte. 3 for approximately 8 miles. Follow the signs for "DOWNTOWN LACONIA". Upon entering LACONIA, you will come to an intersection and a set of lights (The Landmark Inn will be on your Left), move into the LEFT HAND LANE, and take the LEFT. Go STRAIGHT through Downtown Laconia (It's a one-way street). You will come to a stop sign. Continue straight through Downtown until you come to a set of lights (Move into the LEFT lane). Take a LEFT. The old railroad station will be on your right (now occupied by Prescott Flower Shop, Las Pinatas Restaurant, Kramer & Hall Goldsmith). Take a RIGHT immediately after the railroad station and go over the railroad tracks. This is Pleasant Street. The Wilkinson-Beane Funeral Home is one block up on the LEFT hand side (4th building). Ample parking is available at the rear of the building. For handicap parking and entrance, turn into the driveway between the funeral home and the white Unitarian Church. Take US RT. 4 West/NH RT. 16 North off of RT. 95. Rt 16 North becomes NH-16 North/US-202 East(Portions toll). Take the RT. 11 West Ramp towards FARMINGTON/ALTON. Turn Right onto NH-11. Stay Straight into Alton, Gilford, then Laconia onto US-3,-Union Ave (Bayside Cemetery on RT) follow until you see (Cantin Chevy Dealer on LT & RT) at next light (Irving Station on Left) Y intersection take the Right onto Messer St. Follow till end to Church Street. Take right go through two sets of Lights (Train Station on RT) take Right over train tracks onto Pleasant Street. One Long Block up on the Left. (Large Yellow Building) 164 Pleasant Street. 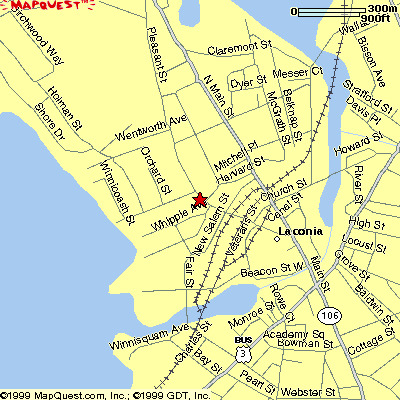 Click on the map to get driving directions to Wilkinson-Beane Funeral Home at 164 Pleasant Street, Laconia, NH 03246.